I’ve had time to notice the moon more lately. Weekends away from work, my depth perception filters out further now. I look up and out more for natures clock, rhythms that get lost to me inside the trappings of the daily grind. 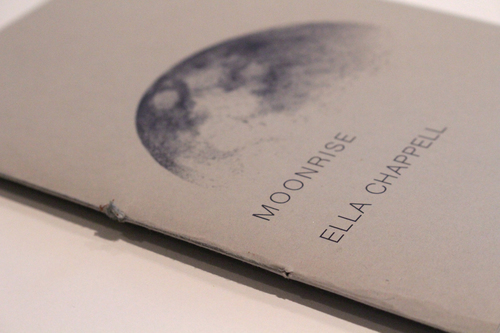 A poetry book that has sneaked into my night is Ella Chappell’s Moonrise. Between The Moon And Me There’s A Zinnia has me recalling the NASA project, the new nature. The zinnia bloomed in space, and its outcome’s having us all pondering a world we wont get to see. Down on earth, Ella is spinning plants into lines that hook into me. I’m latching onto theories that I can comprehend. Every now and then, one wonders if this poetry is sat in places that I cannot find any meaning in. At first it felt like reading the quantum physics of intimacy. It may have been too personal. I felt I was somewhere I shouldn’t have been, watching, listening, hiding in the void. But this poetry needs to be alone with you for a while, take you under the sheets. It’s my third time in the warmth and personal space of this poet. Each time, I am even more gobsmacked at the images, the beauty, the understanding of all of this. We head through phases of the moon. Longitudes and time add another measurement of space between thoughts here. They have a mathematical edge, a sparkle in a cosmic dance. There are bees and lots of family and lots of love and links with eternity. 20.13, 90% waning gibbous is just part of her moon diary of feelings, her stories, our natural flow. My Childhood Vs Donald Trump is a brilliant parallel of lives, of thoughts, of opposites. His vulgarity perplexing. There was one poem that shook me, made my eyes go wide with amazement. Blue buttercups is a mania of happiness which I adored, ‘post-euphoric sweat so thick it slips off his neck‘ one can only reflect this poems lust for life. The night shots, a reflection of lights from many sources, really suits the chosen prose even though the daylight is paramount. This poetry book was published by Rosie Sherwood from As Yet Untitled publishers who specialise in limited edition, handcrafted literary works. Moonrise is available via their website.